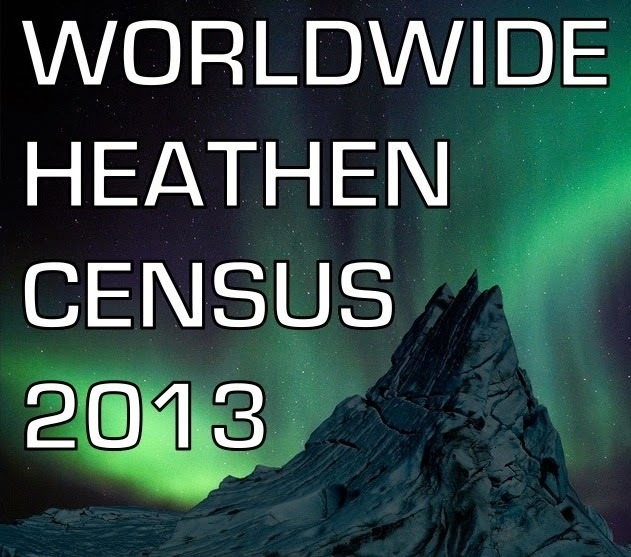 The Worldwide Heathen Census 2013 seeks to establish an approximate number of adherents through an anonymous survey with only one item: a pull-down menu where the respondent selects his or her home country. It is hoped that the anonymous nature of this census will attract responses from heathens who may not want to put their name on an official form from a governmental agency or research institution. Results will be posted on this page. They will hopefully serve as a resource for journalists, academics and researchers. Most importantly, the results will give at least an approximate answer to a question on the minds of many heathens: "How many of us are there?" Let's put aside differences of terminology. There are very real differences between different forms of this religion. Some practitioners are opposed to the word "heathen" itself. I respect these differences and realize how important they are. However, this census seeks to – for just this one brief moment in time – move beyond these differences in order to get a sense of the worldwide community. If your preferred term is not included, I apologize. It was simply an oversight. The point is that this census is meant to include as broad a range of heathens as possible. As long as you self-identify as someone who belongs to any of these paths, please participate and help us create a true representation of worldwide heathenry. Let's put aside differences of belief & practice. There are very important differences in the way that heathens around the world approach belief, ritual and organization. There are intense disagreements on what it means to be part of this religion, of who can be a heathen and of how the faith is defined. With the greatest respect for the deep feelings people have about these issues, this is not the place to have these arguments. 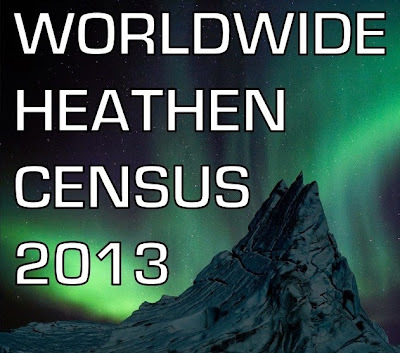 The goal of this census is to gather data on the number of heathens worldwide, not to start yet another argument over the nature of the religion. In order to avoid these disagreements from swamping the census, comments on this post have been disabled for the duration of the survey. If you have questions or constructive comments, please use the contact form to submit them. Who should participate? Who should not? If you self-identify as a heathen and heathenry is your primary expression of faith and religion, please participate – we need you to respond for this census to be at all accurate. 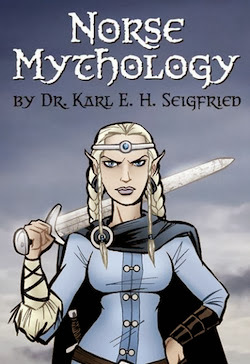 If your core religious identity is as someone who practices any variation of Germanic paganism, as someone who honors the Æsir and the Vanir, as someone who follows the Old Way in the modern world – we need you to add your voice to this survey. However, if you practice a form of eclectic paganism that includes Germanic deities among veneration of a broad range of figures from other paths – please do not participate in this particular project. If you venerate the Norse gods as merely one part of a more generalized pagan practice – please do not submit an entry in the survey. We respect your choice, but it is simply not what this particular survey is about. Purely in the interest of gathering some very specific data, we are trying to move beyond the conflation of heathenry with other pagan religions – as has so often been the case in previous surveys of religious affiliation. We are trying to finally make an estimate of heathens as a distinct group, as opposed to an invisible presence within the "pagan" or "New Age" marker in more generalized surveys. Thank you for your understanding and support. The census has been designed to be (1) anonymous and (2) easy. Simply scroll to the bottom of this post, select your home country from the pull-down menu and click the "submit" button. That's all there is to it. Responses will be accepted for three full months – from October 1, 2013 through December 31, 2013. At that point, the form will be disabled. This page will continue to serve as the public record of census results. Please submit a response only for yourself as an individual. 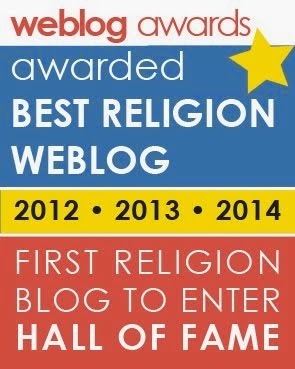 Do not submit for other heathens in your area, members of your organization, family members, etc. If you are part of a community of heathens or have contact with other heathens, please tell them about the survey – but do not respond on their behalf. The only way these numbers will have any real meaning is if everyone acts in an honest and honorable fashion. This is a serious survey with a serious goal. Please do not skew the results by submitting false entries. Results will be updated daily and posted here. Final results will be posted after the census closes on December 31. THE CENSUS IS NOW CLOSED. The census form may not show up in some browsers. THE CENSUS IS NO LONGER ACCEPTING ENTRIES. If neither of these methods work, please write to me via the contact form, and I will enter your submission manually. If you wish to remain anonymous, simply enter "X" for all identification fields. In the "Your Question" field, type the name of your country and ask me to enter you in the census. Remember, only one entry is allowed per person. THE CENSUS FORM HAS NOW BEEN DISABLED.